Sweet potato is fat-free, packed with fibre and vitamins and has a lower glycaemic index than normal potatoes. In short, these are fries for people who don't eat fries, who have sworn off potatoes, or who don't wish to deep-fry. Serve with a bowl of yoghurt swirled with harissa chilli paste for dipping. They go equally well with drinks, a simple grill or an eggy weekend brunch. 1. Heat the oven to 200. 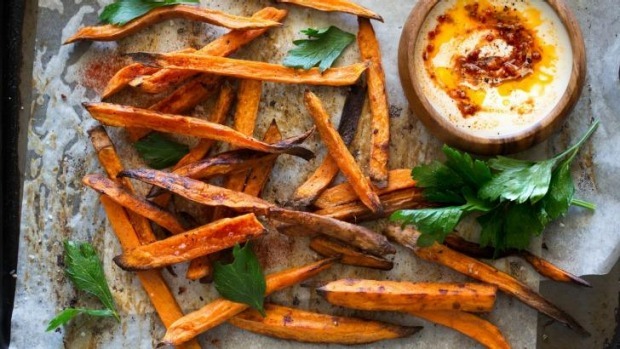 Cut the sweet potatoes lengthwise into one centimetre slices, then cut each slice into long, thin chips. Toss lightly in olive oil, smoked paprika, cumin, sea salt and pepper, and scatter over a tray lined with baking paper. Bake for 20 to 25 minutes, turning once, until tender. 2. Remove the fries and toss in beaten egg white, garlic and parsley. Raise the oven temperature to 210 and return the fries to the oven for a further 10 to 15 minutes (keep an eye on them in case they start to burn). Serve hot.